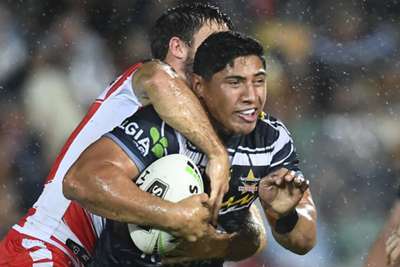 The North Queensland Cowboys were dealt a huge blow after confirming star Jason Taumalolo would miss at least six weeks due to a knee injury. Taumalolo, the 2016 Dally M Medallist, was hurt during the Cowboys' 29-10 loss to the Brisbane Broncos on Friday. The Cowboys confirmed on Monday that the 25-year-old New Zealander could be sidelined for up to 10 weeks. "Jason Taumalolo has sustained a grade 3 medial ligament injury," they wrote on Twitter. Jason Taumalolo has sustained a grade 3 medial ligament injury. "He is expected to miss 6-10 weeks." North Queensland are 12th in the NRL ladder after one win from two games, and they host the Cronulla Sharks on Saturday.